Engineer: Brown and Gray Engineers, Inc. 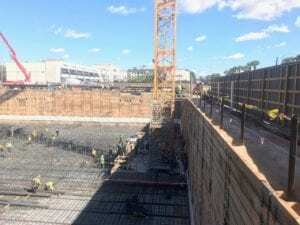 Lowering groundwater more than 30 feet (ft.) below ground surface during construction of a 30-story high rise building in Downtown Houston. The project consisted of the construction of a 30-story high rise building with 2 levels of below grade parking. The deepest subgrade (approximately 30.55 ft. below grade) extended to a depth below the water table (which sat approximately ±16.5 ft. below grade). An engineered dewatering solution was required to lower groundwater below the proposed excavation. 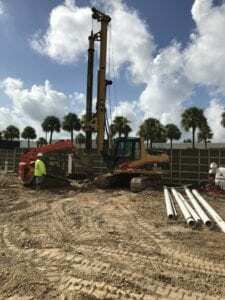 Griffin installed a deep well dewatering system to assist in control of groundwater to allow construction to be conducted in a safe and efficient manner. Twenty (20) wells were drilled surrounding the shored excavation. Griffin also installed a piezometer at each deep well to monitor water levels All wells and piezometers were drilled to a depth of ±70 ft. and were completed with well screen, casing, and gravel pack. Griffin also furnished and installed a well pump system consisting of twenty (20) each 1.0 to 2.0hp, 460v/3 phase electric submersible pumps. Each pump was equipped with valves/fittings and on grade electrical distribution. Griffin provided the electric wiring to the pump control panels at each well location. Effluent from each well was directed through a common manifold (approximately ±800ft) to the designated discharge point. The total flow for the deep well dewatering system was approximately 250 GPM. We addressed the extremely deep excavation by designing a deep well dewatering system capable of lowering groundwater more than 30’ below grade. The system was installed at the perimeter of the excavation prior to work beginning in the excavation. This ensured that the dewatering effort had minimal impact to excavation work and schedule. The contractor was able to maintain their schedule because the dewatering system is kept groundwater under control.